The 80th anniversary of the Organization of Ukrainian Nationalists (OUN), being marked one of these days, is unlikely to draw too much attention. What is being hotly debated in Ukraine is the UPA (Ukrainian Insurgent Amy), the OUN’s armed branch, Roman Shukhevych, who held various posts in the organization and even headed it, and Stepan Bandera, known as the OUN top leader. These subjects and personalities have their followers and adversaries. But the Organization of Ukrainian Nationalists itself is outside the societal discourse. After all, this can have a logical explanation: the OUN has been a legally unrecognized entity for 80 years now. These words open A Tribute to Ukrainian Nationalists, the OUN anthem. While the organization was still in the making, Col. Yevhen Konovalets emphasized that “we live in an infinitely great era. It is one of the revolutionary epochs that span decades and forge a new world and new man. We have this choice in the great worldwide drama of our time: to be either the creators or the victims of history”. At the very outset of their activities, Ukrainian nationalists really strove to be the creators of history. Even before the OUN was established at a Vienna congress on Jan. 28—Feb. 3, 1929, the Konovalest-led Ukrainian Military Organization (UVO) was already one of the most active Ukrainian entities. The result of the two attempts the UVO made in 1920 and 1924 in Lviv on the life of the Polish political leaders — Marshal Jozef Pilsudski and President Stanislaw Wojciechowski — was the reason why no Polish leaders ever visited Lviv openly and officially until the Polish state’s downfall. In the course of time, OUN activities assumed such a scale that the Polish newspaper Bunt mlodych wrote in 1933: “The mysterious OUN — Organization of Ukrainian Nationalists — is now stronger than all the Ukrainian legal parties combined. It dominates young people and is forming public opinion and working at an unprecedented pace to draw the masses into the whirlpool of revolution.” This characteristic was no exaggeration — in the combatant field alone, there was a large number of successful attempts, including the assassinations of the Soviet consul in Lviv and the Polish interior minister in Warsaw. Although political assassinations were not among the organization’s priorities, they tended to change the awareness of Ukrainians and Poles. As political “trials of Bandera and his comrades”, to quote a journalist’s phrase, were underway, the Poles took a different look at the Ukrainian liberation cause. “Those people killed, wishing to serve the cause of their nation. We do not think this was a really good service. But they are serving it successfully now: three-fourths of the Polish press, which has eschewed the word ‘Ukrainian’ for 17 years, have learned this word in the past three weeks and will never forget it. And those who used to call these people no other than ‘haidamaky,’ are ashamed today of the stupid brand of ‘somber looks’ that they would put on them” (Wiadomosci literackie, No. 50, Dec.15, 1935). In addition to these assassination attempts, there was tremendous propagandist and educational work. Researchers estimate that only in the first six years of OUN activities (1929—1934), 1,024 Ukrainians were sentenced to a total 2,020.5 years in prison, four to capital punishment, and 16 to life imprisonment. This occurred, incidentally, well before the most high-profile political trials of OUN leaders. Yet, as the organization was still in the making, there were some small details that showed differences in its activities “in the homeland” (Western Ukraine) and abroad. 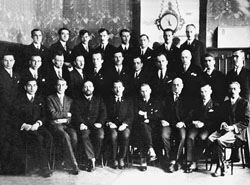 Delegates of the 1929 OUN founding congress had a group photograph taken. The picture shows 27 congress participants, seven of whom resided in Galicia. Three years later, in September 1932, a trial began in Lviv, which went down in history as the “trial of congress delegates”. Sitting in the dock were six people (one of the original seven had died by that time). On the basis of one photo, the congress delegates were sentenced to four-year imprisonment each. An ordinary photo became an “acid test” for the underground organization. For what was allowed to OUN militants outside Poland was prohibited and dangerous to “homeland fighters”. Small wonder that tiny but essential differences in their activities caused two splits in the organization in the 1940s. The May 1945 Declaration of the OUN Leadership has some of the lines that more than once characterized the behavior of nationalists at the time of the geopolitical changes that swept through Europe for a decade, from the mid-1930s until the mid-1940s: “There may be days of triumph and decline on a great and sacred way of the liberation struggle of an enslaved people, and we are not going to make our actions dependent on a future showdown. As an active generation of the people, we are discharging our civic duty irrespective of whether we will be given a wreath of thorns or laurels for this. We do believe in the strength and resurrection of Ukraine”. Therefore, in spite of absolutely unfavorable conditions, OUN militants twice attempted to revive Ukrainian statehood — first, when a large number of leaders set out clandestinely to proclaim, build, and fight for Carpathian Ukraine. Taking into account that the Czechs surrendered their state without resistance, the action of Transcarpathian defenders looked like a true exploit. For even today some historians claim that the March events in Transcarpathia should be considered the beginning of World War Two. And the Polish newspaper Merkuriusz Polski printed on its pages something that perhaps not only Poles thought: “We must say bluntly that after the latest events we are more respectful of Ukrainians than of Czechs and Slovaks. No matter what kind of people those ‘Sich men’ may be, they did not moan and did not lay down their arms but fought in the most difficult political and strategic conditions”. Later, on June 30, 1941, the OUN proclaimed the Act of Ukrainian Statehood Restoration in Lviv. True, Lithuanians beat Ukrainians in proclaiming their state, but the fact itself is very eloquent. This again revealed the essence of organized nationalism: to believe in your own strength only and disregard any obstacles. After doing a term in a Nazi concentration camp, the Ukrainian state’s premier Yaroslav Stetsko wrote: “When we were unable to defend the June 30, 1941 Act with tanks, guns, bombers, and a sufficiently strong army, for such were the circumstances, we decided to resist the invaders’ tanks, guns, and bombers by adhering to the idea of national sovereignty, dignity, and pride of a spiritually strong nation, by showing our unbreakable character, brave heart, and fearlessness in personally defending the proclaimed cause. We were determined not to deny or revoke this under any conditions and to hold on to the end”. The June 30 Act also gave rise to the phenomenon of “OUN mobile groups”, when about 7,000 members of the organization went to Eastern Ukraine to proclaim statehood, revive public life, and exercise self-government. This apparently irked the Nazis but greatly encouraged the Ukrainian population in the Dnipro River basin, and Ukrainian nationalism found its followers among a wide circle of intellectuals, such as Ivan Bahriany, Vasyl Barka, Hryhorii Vashchenko, and many others. During the war the OUN managed to organize a high-profile resistance movement, widely known as UPA, and establish an underground governmental body, the Ukrainian Supreme Liberation Council (UHVR). The long years of self-denying armed struggle ended in a defeat, but this was very ample evidence of the Ukrainian people’s great aspiration to have a state of their own. Word has it that when Gen. de Gaulle came to know about the Ukrainian armed struggle, he said: “If I had an army such as the OUN has, the German jackboot would never have trampled the French soil”. It is difficult to say whether this was really said but it is beyond a shadow of a doubt that the Ukrainians created one of the most powerful resistance movements. While the nationalist movement’s strength was perhaps limited to a few thousand members, the OUN area commander Ivan Klymiv “the Legend” reported to the leadership at the beginning of Second World War that there were 20,000 loyal fighters in Galicia and Volyn. During and after Second World War, the resistance movement embraced several hundred thousand people. Astonishingly, in Soviet prison camps, too, nationalists formed a clandestine network known as OUN-North, or Trans-Polar OUN Leadership. The Banderites changed the daily routine in the mala zona (small camp), as they called prison camps, while the term velyka zona (great camp) referred to the USSR as a whole. They organized a number of full-scale uprisings, the most well-known of which were in Norilsk and Kingir, and put an end to the mayhem of criminal prisoners. In his book The GULAG Archipelago Aleksandr Solzhenitsyn speaks respectfully about the role of Ukrainians in overcoming the criminal havoc: “They did very much for the entire movement, and it is they who brought things into motion. The Dubov batch brought us the bacillus of revolt. Young, strong guys, fresh from the guerrilla’s path, they... looked around, were terrified by this sleeping slavery, and reached for knives”. To imagine the strength, authority, and morale of the Banderites in prison camps, suffice it to read testimonies of Jewish camp inmates deported from the USSR. Avraam Shyfrin, Anatoly Radygin, Mikhail Kheifets, Yury Vudka, Idel Kogan, and some other political prisoners have left emotion-filled testimonies on the Ukrainian nationalists. Radygin described a generalized image of a Banderite: “When a neat, spruce, calm, little-spoken, and clean-shaven man, wearing a clean shirt, well-shined shoes, and carefully-ironed prison fatigues, would suddenly appear in a bustling mass, you could guess almost unmistakably his nationality, party membership, and the colors under which he had fought...” Those were people loyal to a radiant idea and the once-taken oath. Many of them were tortured with starvation and cold no less and even more than the others, and they had lost so many comrades on the hard and bloody roads from the Carpathians and Kovel to Karaganda and Mordovia. Their fanaticism bordered on monastic self-denial. Most of them did not smoke or take alcoholic drinks when we managed to get hold of the latter”. A still less known story than life in prison camps is the development of Ukrainian life in the diaspora. It is here that the OUN created altogether different Ukrainian realities — with numerous civic institutions, from youth educational entities, such as the Union of Ukrainian Youth (SUM), which has brought up more than one generation of diaspora figures and is now operating in Ukraine, to the Anti-Bolshevik Bloc of Nations (ABN), an organization that became an international representation of the enslaved nations. Yaroslav Stetsko, the OUN’s longest-standing leader and head of the ABN for 18 years, was a personal friend of Chiang Kai-shek and Gen. Fransisco Franco; under his influence the former commander of NATO’s North Army Group, John Hackett, wrote the book Third World War, where he modeled a situation in which nationalists would seize control of the KGB and stage a coup d’ tat. In the era of independence, the three OUN branches — Banderites, Melnykites, and dviikari — emerged in Ukraine in a different form. For instance, the Melnykites were legalized as an eponymous civic organization; they also set up a number of other civic entities and publishing houses. The dviikari are not represented organizationally, but they have made their own contribution to the literary life of Ukraine, when they moved here the editorial office of the journal Suchasnist. The “revolutionary” OUN faction (Banderites) are not legally registered in Ukraine. After founding a number of civic institutions and a publishing house, they created a legal political force, the Congress of Ukrainian Nationalists, which managed at a certain point in time get some members, headed by with Yaroslava Stetsko, elected to the Verkhovna Rada. Symbolically, Ms. Stetsko twice read out the Oath of a People’s Deputy on behalf of all the MPs. Stepan Bandera wrote in 1958, a year before his tragic death: “To be member of a revolutionary liberation organization means to fully devote yourself and all your lifetime to the cause of liberation, fully place yourself at the organization’s disposal, and be ready every hour to obey any order in spite of difficulties and dangers”. For eight decades the OUN was creating the history of Ukraine in spite of obstacles and the price that had to be paid, fulfilling the key demand of The Decalogue of a Ukrainian Nationalist: you shall obtain the Ukrainian state or die in a battle for it!